Thirty-nine distilleries opened in the UK last year as demand for ‘craft’ spirits continues to grow, according to figures from national accountancy group UHY Hacker Young. The figures, which include whisky makers and gin-producing microdistilleries, bring the total number of distilleries to 315. In total, 201 new distilleries have opened in the UK in the last five years. According to UHY Hacker Young, 18 new distilleries opened in Scotland, as a result of rising demand for Scotch whisky. James Simmonds, partner at UHY Hacker Young, said: “More craft gin, rum and whisky distillers are riding the wave of the mixed drinks and cocktails trend, particularly among young people. “Many innovative new distillers are experimenting in new and adventurous ways of producing these spirits. 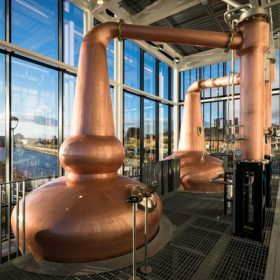 Distilleries to open in 2017 included the Clydeside Distillery, Glasgow, and The Oxford Artisan Distillery, Oxford. Recent HMRC data shows that sales of spirits in the UK rose to a record high of £3.5 billion in 2017, up from £3.3bn the year before.